Rural Kids With Disabilities Hurt Most By Texas Cuts To Medicaid, Providers Say : Shots - Health News State lawmakers cut $350 million in Medicaid funding to early childhood intervention therapists last year to help pay for tax cuts. Now rural toddlers are finding it hard to get vital treatment. Intensive home-visits by physical, occupational and speech therapists have been "a lifesaver," for little Haylee Crouse, her mom Amanda (left) told Shots. Haylee, who is now 2, developed seizures and physical and intellectual disabilities after contracting meningitis when she was 8 days old. Last year, the Texas legislature approved a $350 million cut in Medicaid reimbursement rates to early childhood intervention therapists and providers. The cuts, made to help balance a billion dollars in property tax relief, affect the most vulnerable Texas children — those born extremely prematurely or with Down syndrome or other genetic conditions that put them at risk for developmental delay. For months, providers of in-home physical, speech and occupational therapies have continued to serve children who have disabilities, despite mounting financial losses. Now some have had to shut their doors, curtail services or halt their home-visit programs, leaving many children without treatments their parents feel are crucial to the kids' well-being. That's what's happened to 2-year-old Haylee Crouse, who lives with her three brothers and sisters in the small town of Whitehouse, in East Texas. When she was just 8 days old, Haylee contracted newborn meningitis. It left her with some mental and physical deficits, and she started having periodic seizures. 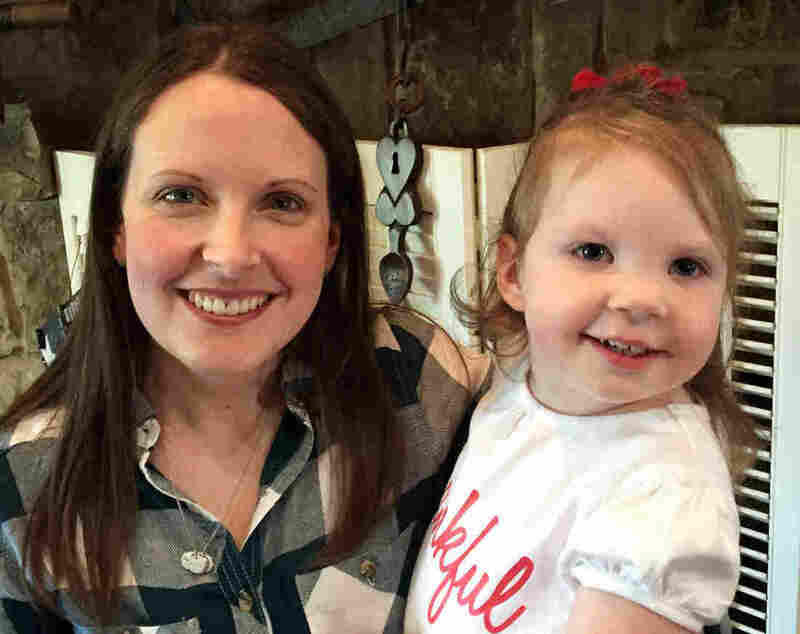 But at the age of 9 months, Haylee started getting home visits and treatments from physical, occupational and speech therapists, several days a week. The therapists worked for the non-profit Andrews Center, in Tyler, Texas. Amanda Crouse, Haylee's mother, said the therapists have made all the difference in the world for her baby girl. "They were a lifesaver to her and to our family," Crouse said. "They worked her hard. For example, she was not rolling over. They taught her how to roll over. They then taught her how to crawl, pull up on the couch and then, finally, she learned how to walk." Today, Haylee walks and laughs and is learning to talk. But all this progress is now at risk, her mother says. The state's cuts to its Texas Medicaid Acute Care Therapy Programs have meant that the one provider of early childhood intervention treatment in Tyler — which has provided in-home therapy to hundreds of families in five East Texas counties — can no longer do so. And so, that's it. On the 2-year-old's last day of therapy, Crouse said, "her therapist actually cried. Gave her a hug, said goodbye. We took a picture, just to kind of document that moment. And it was an emotional day." As news of the cuts became public, parents and grandparents of children who have disabilities flocked to Austin in March to implore the state Senate not to do this. Mothers wept in frustration as they testified before the Texas Senate Finance Committee about the vital these early interventions play in their children's quality of life. "This is Elijah," Mary Castro told the committee members that day, holding up a photo of her 2-year-old son. "When my son was born, my husband and I found out eight days later that he has Down syndrome. He's medically fragile and developmentally delayed." Without the support of early childhood intervention therapists that Medicaid provided, Castro told the lawmakers, "Elijah would not be walking, signing, doing word approximations, dancing to music, or interacting with his peers. With that said he is delayed. Quite delayed. But we love him, and he loves people." Republican Sen. Jane Nelson, who heads the Texas Senate's finance committee, tried to reassure Castro and other anguished parents that the state would make sure there would be no interruption of services, whatsoever. "Every eligible child for these services will continue to receive them," she told the parents. "And we're going to monitor it and we're going to make sure that happens." But that's been a promise the state has not been able to keep, and it's in the rural parts of Texas where collapse of service has already begun. "Sometimes you need to come out to these rural areas and see how things are done — and how they have to be done — and even talk to some of the parents before you just decide to cut a program," said Waymon Stewart, the executive director of the Andrews Center in Tyler. Stewart predicts that children with profound disabilities will suffer most from the closure of his program and others like it, especially in rural regions. It's not uncommon for early childhood intervention therapists to have to drive an hour each way to get to far-flung patients. For children who are prone to seizures, or who have to be connected to machines for daily living, long trips in the car several days a week for treatment in other clinics are simply not going to happen, he says. The cuts made in the state capital took a $312,000 bite out of his center's budget, forcing him to terminate 20 employees. "It really hit us hard," Stewart said. So we were really digging into reserves to try to make this program last, and we did for a year." But after that, he said, "we just decided to give our notice. We couldn't continue to do it unless the rates were changed." In Wichita Falls, 235 miles away, the same thing has transpired at the North Texas Rehabilitation Center, which serves 10 North Texas counties. Mike Castles, the center's president, said they hung on for a year, but it cost them more than $200,000 in losses. So, after 30 years of service to thousands of North Texas families, that's it for them too. "It's all about money," he said, "and it created some internal problems financially with our other programs as well. There's just so much money to make this all work. We tried to for a year; it got worse instead of better with even more bad news coming for this fiscal year." The state is actively hunting for new therapy providers. But the trick is finding new providers who can make work the same difficult financial circumstances that drove previous health providers out of the program. Texas Health and Human Services has notified NPR that it recently contracted with new therapy providers in Tyler and Wichita Falls.